Soil sampling and analysis or testing is a simple yet effective means of ensuring that soil can be treated correctly to ensure healthy grass growth for horse grazing purposes. If you have recently moved to a new property or would like to understand more about your grassland, having your soil sampled and analysed is a very good place to start. It can also be very useful if productivity seems to be diminishing year on year. Sampling involves taking multiple small samples that represent the area/paddock in question. From this sample several tests are carried out. We can post sampling kits out to you so you can collect your own samples at your own convenience. We will then send them off to the laboratory and report results back to you by email within 10 working days. A pH test will determine the pH level of the soil. A pH level of 6.5 is perfect for horse pasture. If the pH is low, the grass may grow weakly and only provide partial or patchy grass growth. In the same respect a high pH soil may result in other problems such as causing some elements in the soil to become unavailable, which often means the grass has deficiency. As well as pH, there are 3 other main elements that once balanced correctly will support optimum grass growth. The desired indices will depend on the present and future crop or use of the field. We do not usually test for Nitrogen as the test is expensive and not very relevant to equestrian grazing where only low levels of Nitrogen are required. Nitrogen provides encouragement for stem and leaf growth whilst phosphate and potash are responsible for root and grass health. If these elements are found to be out of balance it may be necessary to apply fertiliser. The first number is Nitrogen (N), which promotes overall grass shoot growth. The second number is available Phosphate (P₂O₅), which promotes strong root growth. The third number is soluble Postash (K₂O), which helps grass withstand stress, drought or disease. 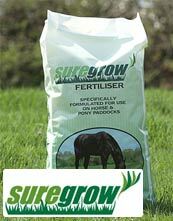 For example, a 11-22-0 fertiliser such as Suregrow has 11% nitrogen, 22% available phosphate and 0% soluble potash. Nitrogen, phosphate and potash are also sometimes referred to as N-P-K. Together with our agronomy partners we are then able to recommend appropriate actions. This may include applying lime which will help to restore the correct pH and/or the spreading of fertiliser by Shire Country Services. We will cost up the actions and provide you with a price to undertake them as well as a cost of products to be used.